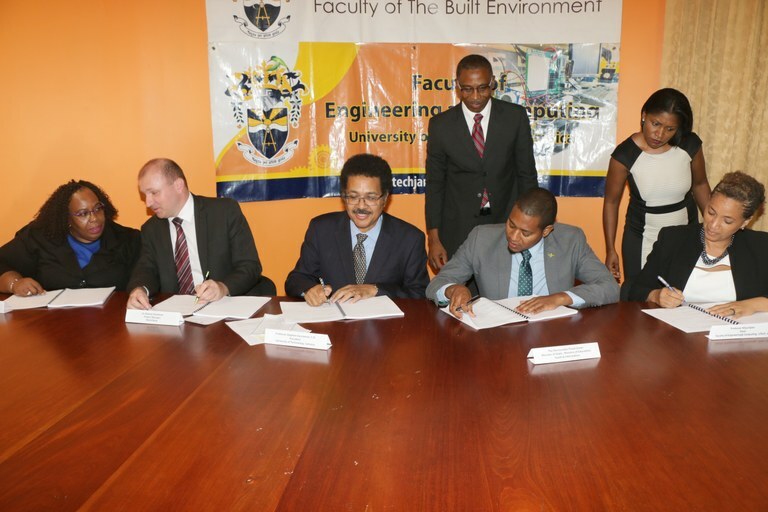 UTech, Jamaica Signs Contract with Ministry of Education and the World Bank for Jamaica Safe Schools Project — UTech, Ja. Partners in the Jamaica Safe Schools Project: School Inspection Programme affix their signatures to the contract documents at a special signing ceremony held on Monday, May 1, 2017 at the University of Technology, Jamaica’s (UTech, Jamaica) Papine campus. Seated from left are Ms. Marcia Phillips Dawkins, Managing Director, National Education Trust (NET), Dr. Roland Bradshaw, Project Manager, World Bank, Prof. Stephen Vasciannie, CD, President, UTech, Jamaica, Hon. Floyd Green, Minister of State, Ministry of Education, Youth and Information and Prof. Nilza Aples, Dean, Faculty of Engineering and Computing, UTech, Jamaica. Standing are Associate Prof. Garfield Young, Dean, Faculty of The Built Environment, UTech, Jamaica and Miss Latoya Harris, Director, Donor and Partnership Management, NET. The thrust to reduce vulnerability and improve infrastructural resiliency in public schools across Jamaica has received a boost with the signing of a contract among partners, University of Technology, Jamaica, the Ministry of Education, Youth and Information, the World Bank and the National Education Trust (NET) for the implementation of the Jamaica Safe Schools Project: School Inspection Programme (JSSP). The contract for the implementation of the JSSP was signed on Monday, May 1, 2017 at UTech, Jamaica’s Papine campus. The JSSP is part of a larger National Education Sector Development Plan to support the Government of Jamaica in “mainstreaming disaster risk management in the regulation, planning, designing, construction and management of school infrastructure.” Under the JSSP project, 971 public infant, primary and secondary schools across Jamaica will be inspected to assess the risk, structural and functional needs. These assessments will enable the Government of Jamaica to prioritize investments plans to build infrastructure resilience in these schools. In his welcome remarks, Dr. Garfield Young who chaired the contract signing ceremony expressed pride that UTech, Jamaica was selected by the Ministry of Education, Youth and Culture to conduct a comprehensive data collection process for the compilation of the inventory of the public school infrastructure. Students from the University’s Faculty of The Built Environment and the Faculty of Engineering and Computing will participate in this aspect of the project. Pointing to data from the World Bank indicating that “Jamaica is one of the most at risk countries in the world with high percentages of GDP and population at risk to two (2) or more hazards,” the Minister noted that between 1900 and the year 2000, damages from disasters in Jamaica cost 12.6 per cent of GDP with infrastructure usually recording the highest economic impact. With schools often being used as public shelters in times of disaster, the Minister pointed to the significance of ensuring that all schools receive the required infrastructure improvements and upgrades to bring them up to building code standards. Managing Director of the National Education Trust (NET), Ms Marcia Phillips Dawkins explained that the NET assisted the World Bank in preparing and submitting a grant proposal to the Trust Fund through the German Government via the Global Facility for Disaster Risk Reduction and Resilience for the implementation of the Jamaica Safe Schools Project. The US$500,000 grant was approved for implementation of the project over a three years period. Dr. Roland Bradshaw, Project Manager, World Bank in his remarks said that the JSSP project represents an investment in the future of Jamaica and will be of great significance in informing a national information risk platform. He said the World Bank was particularly pleased to fund the project which gives future graduates of UTech, Jamaica, the opportunity for hands on work on “a real project” affecting public buildings in Jamaica. Bradshaw reported that under the Disaster Vulnerability Risk Reduction Project (DVRP), the World Bank is investing $30M US dollars in various technical assistant projects to build infrastructural resilience and reduce disaster vulnerability in Jamaica. Prof. Nilza Aples, Dean, Faculty of Engineering and Computing gave a comprehensive overview of how the JSSP will be implemented. She noted that the project will commence with a pilot involving the inspection of fifty (50) schools - forty-six (46) in Kingston and four (4) schools in St. Andrew. The information provided from the data collected from the pilot schools will be used to establish a digital information template which will inform the data collection process from the remaining schools. She shared that the project should be completed within two years with two major outputs – the establishment of a school infrastructure baseline and database which will form a master database and a final report providing an analysis of the data. Training of faculty and selected students began this week.